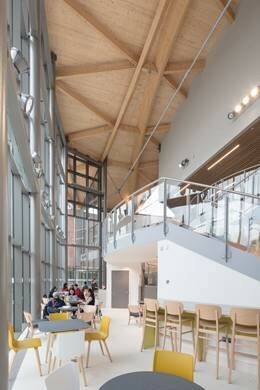 Berman Guedes Stretton has created a new visual focal point for the University of Warwick. 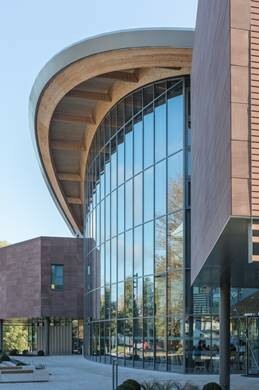 A new state-of-the-art teaching centre named The Oculus features an impressive 18m tall glazed frontage to University Road beneath a striking curved laminated timber roof. The Oculus is the latest addition to the Russel Group university’s main campus and is the first new building in a new phase of development. The £19.1m centre delivers much needed lecture and seminar spaces for the ever-expanding student population and is the first interdisciplinary building on campus that will be used for teaching by all departments. The 4,750sqm building contains two large lecture theatres, 12 seminar rooms, flexible social learning spaces and a café. 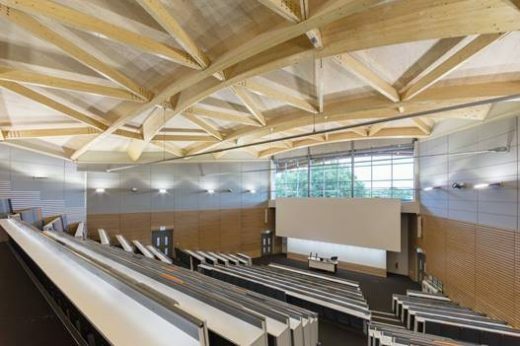 The two tiered lecture theatres, with 250- and 500-seat capacities, are stacked beneath the dramatic timber roof. The larger upper theatre, now the largest on campus, is open to the underside of the timber roof and benefits from ample daylight and a state-of-the-art edge blended projection screen. The wings of The Oculus accommodate 12 top quality, flexible seminar spaces, ranging in size from 30 to 100 seats, that include the latest teaching assisting technology such as multiple projection screens, ultra HD high brightness projectors, visualisers, touch panel controls, wireless audio, lecture capture and webcast facilities. Berman Guedes Stretton’s design also incorporates a system of electronic displays outside the entrances of all rooms to provide live room booking information and indicate when rooms are free for use by students outside of teaching time. In addition to the advanced technologies provided within all seminar rooms, the design includes an exceptional feature for the three largest of the four ground floor seminar spaces – the external walls can be opened up onto landscaped external terraces matched in size to the rooms within. This novel feature was developed in collaboration with the university’s Institute of Advanced Teaching and Learning (IATL) during the briefing stages to align with their aspiration to encourage more inside/ outside learning activities, capitalising on the green campus environment. All of the ground floor seminar rooms’ storage space is cleverly integrated to allow the rooms to be entirely cleared of furniture to suit a variety of different uses such as innovative movement-based teaching models, conferencing events, and use by student societies outside of teaching hours. At ground floor level within the central atrium an impressive 7x3m ultra HD four-screen video wall has been integrated into the timber panelling, showing a varying display of timetable and wayfinding information, upcoming events, livestream broadcasts of oversubscribed talks from the main lecture theatre, and ‘chem-art’ that the university’s artist in residence, Mary Courtney, has composed in collaboration with the Warwick Chemistry department. The architect’s concept was not limited to the just the building itself. The building was carefully designed to enhance and capitalise on the surrounding natural environment, responding to the different existing contexts on each side of the building. The building frontage has greatly expanded the previously narrow footpath on one of the busiest pedestrian routes through the campus to create a generous paved forecourt, naturally bringing users of the building to the main entrances from any of the key directions of approach. To the east, the change in level between the ground floor external terraces and the adjacent Tocil field has been used to create a natural amphitheatre. An existing double arcade of semi mature silver birch trees has been incorporated into the landscaping scheme to the west of the building, strengthening the pedestrian route through the trees and using them to naturally screen the external terraces on this side of the building. 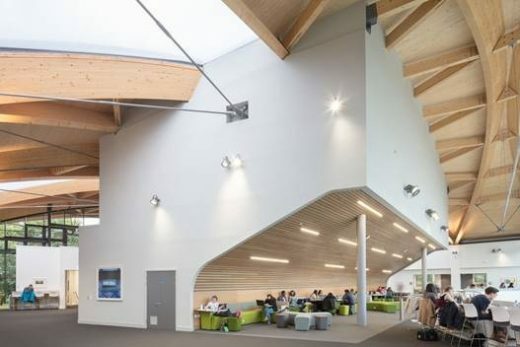 This is the second project Berman Guedes Stretton have completed in recent years for the University of Warwick. In 2015 they delivered the Warwick Business School’s flagship London location on the 17th floor of The Shard, and they have a number of other ongoing projects on campus due to their role within the university’s consultant framework. Berman Guedes Stretton was established in 1996 and today has offices in Oxford and London. The multi-award winning practice has developed a strong reputation for architectural interventions – remodelling, new build extensions and phased, major additions – to historic and also to modern buildings. 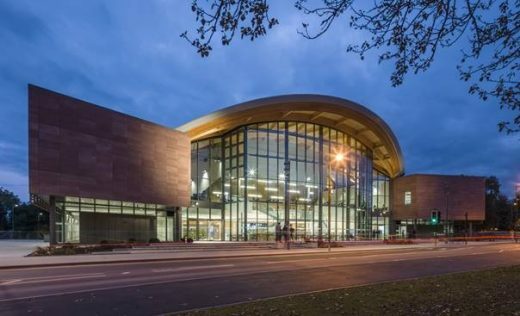 The Oculus is one of a series of major new-build projects recently completed by the practice for Higher Education clients, cementing the practice’s expertise in this sector.